We know. Like we need another “Best Of” list, right? Like there aren’t already more than enough lists that are supposed to reveal the best places in America. Lists compiled by city guides, experts, food critics, reviewers, and who knows who else. “As if we need another one” – right? That said, we still think you should check out the all-new “The Best of Foursquare” list. Why? Because it’s a list of the best places across US cities ranked by the millions of people who actually went there. “The Best of Foursquare” lists are organized by city, and include places for food, nightlife, things to do, and even speakeasies. The places are further organized by category – so there are lists for “sandwich places,” “bakeries,” “wine bars,” and even “museums” and “bookstores.” Do not worry: there are also lists for pizza and beer places. Launched in 2009, Foursquare has a community of close to 30 million users worldwide, and over a million local businesses use its Merchant Platform. Recently, the company introduced a slew of updates, including its own ten-point rating system, an improved personalized map and search engine, as well as an in-app restaurant reservation service through OpenTable. 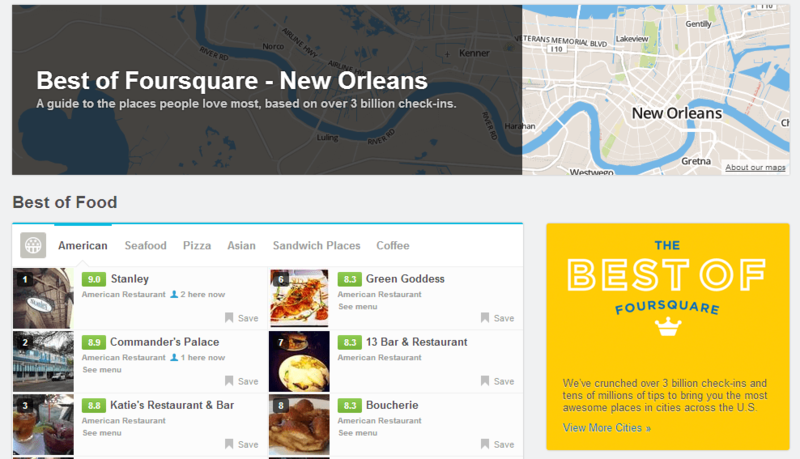 Did your business make Foursquare’s list? If so, congrats! If you didn’t, there’s always next year. (Which is actually this year, because this first list is based on data from 2012.) And if you need help tracking online reviews and ratings on Foursquare, give us a call. We’ll get you started right away. Foursquare is just great. Wherever I find myself at a new or unknown place I search them and find places where to go and what to order. I think that everyone leaving their own town should check this site and find themselves a place where they will end up in the new town. So, this became a must use app for every traveler. @Big Al…Not all of us are eating junk food from Mc’s and KFC. There are also a lot of us who enjoy great meals that are healthy. Unfortunately there are not many places to find such food. So, we search for them and while we are doing that, we would also like to know about those restaurants service, menu etc. So, this is a great way to find all info we need in one place.